The WMT stock price is down 18.11% in the last year, and we just found another major bearish warning for the stock. You see, Wal-Mart Stores Inc. (NYSE: WMT) is falling behind rivals in the explosive e-commerce marketplace despite heavy spending. The Wal-Mart stock price is falling more than 5% today (Thursday) after Wal-Mart Store Inc. (NYSE: WMT) reported disappointing Q4 earnings this morning. Wal-Mart stock is outperforming the Dow Jones Industrial Average this year, having climbed 8% compared to a loss of 6% for the Dow. That's left investors wondering if they should buy Wal-Mart stock after earnings. Some 121 million shoppers plan to shop online on Cyber Monday, down from the 126.9 million who planned to last year. That's troubling for the Wal-Mart Stores Inc. (NYSE: WMT) stock price. The WMT stock price barely reacted Monday to the news that Wal-Mart Stores Inc. (NYSE: WMT) plans to get a jump on Cyber Monday by launching its sales at 8 p.m. Sunday, four hours earlier than usual. That's because it's another sign of Wal-Mart's desperation to shore up its weak online retail presence. The Wal-Mart stock price slipped 3% to $69.55 Tuesday morning after Q2 earnings missed forecasts. Shares have underperformed year to date, down a gloomy 18.39%. Stock market news today, Thursday, April 2, features a big wage announcement from MCD, a WMT stock sell-off, GoDaddy's second day on the New York Stock Exchange, and more. U.S. stock futures forecasted a 12-point retreat from yesterday's close. The Dow Jones today soared 154 points as U.S. markets posted their largest gains in five weeks on Wednesday. Federal Reserve Bank of Chicago President Charles Evans urged the central bank to be "exceptionally patient" when deciding a timeframe on increasing interest rates. Wal-Mart has been in the hot seat lately over low wages, and now its own shareholders have reason to complain. A perfect storm of controversy, bad weather, retail headwinds, and restructuring have the world’s biggest retailer on the ropes. 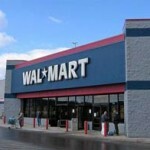 Thursday, Wal-Mart Stores Inc. (NYSE: WMT) will report fourth-quarter earnings before opening bell. A challenging retail environment and recent restructuring are likely to keep Wal-Mart from beating - or even meeting - expectations. That's just one reason investors should steer clear of Wal-Mart stock. The retail superstore has missed Wall Street expectations in three of the last eight quarters and averages a 1% stock loss in the week following earnings. This time around, it is expected to report fourth-quarter earnings per share (EPS) of $1.37 on revenue of $130.55 billion, compared with a profit of $1.67 per share on revenue of $127.92 billion in the same quarter a year ago. Wal-Mart Stores Inc. (NYSE: WMT) stock was up by more than 5% in trading today (Thursday) after the company reported stronger than expected earnings this morning following similar reports made yesterday by Target Corp.
Wal-Mart reported earnings per share of $1.09 compared to $0.97 per share in the same quarter last year. The average estimate for this quarter's earnings was $1.04 per share. Increased sales were a major factor in the positive earnings report. Net sales rose 8.5% to almost $113 billion. Same store sales in the U.S. rose 2.6%, the biggest gain in three years for Wal-Mart in its U.S. market. Wal-Mart "s earnings reports come as they wrestle with allegations of bribery in its fast-growing Mexico unit. In a pre-recorded statement on Thursday, Wal-Mart's CEO Mike Duke commented on the ongoing Mexico bribery investigation saying, "We will take appropriate action if violations of the law or our policies occurred." Same store sales in Mexico grew 5.6% this quarter, second only to Brazil's same store growth of 8.6%. Wal-Mart reported that customer traffic in Mexico increased by 2.3% while the average customer spent 3.3% more per visit. The allegations appeared in a New York Times article on April 21, so it is hard to gauge how much impact the controversy will have as the numbers reported today go through April 30. Wal-Mart's earnings are a good measure of the retail economy in the U.S. The giant discounter draws almost 10% of all non-automotive spending in the U.S. While Wal-Mart remains the leading discount retailer in the U.S. it has lost some of its advantage over other retailers. Throughout the recession Wal-Mart performed better than most companies due to its discount offerings but consumers are now either feeling more comfortable about increasing their spending or are turning to other discount retailers such as Target Corp. (NYSE: TGT). Meanwhile, Wal-Mart is trying a new game with its U.S. stores. 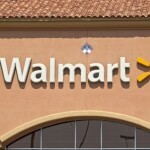 The Wall Street Journal reported today that Wal-Mart is in the pilot phase of introducing "Wal-Mart Express" stores. These stores are much smaller than the popular supercenter, normally around only 15,000 square feet. Wal-Mart hopes these smaller stores located in urban areas will help accelerate its growth in the U.S. and help Wal-Mart compete with other discount and dollar-store chains. Their competitors have already launched smaller locations in a much more aggressive manner than Wal-Mart. Dollar General, Dollar Tree, and Family Dollar Stores Inc. have opened nearly 2,000 locations in the past year. Currently Wal-Mart has fewer than a dozen Express stores open. Wal-Mart has had success with smaller stores outside the U.S. and hopes it can have similar results in the U.S. Last June at its annual meeting Wal-Mart's U.S. store chief Bill Simon said he would like Express Stores "to deliver the same experience that a supercenter can deliver, only in 15,000 square feet." With fewer than a dozen Express stores open it seems that Wal-Mart is reluctant in its efforts to move away from the supercenter mentality. Target plans to open three new "City Target" stores this summer in Chicago, Seattle and Los Angeles. Target's stock was up slightly yesterday on positive earnings. While several other big-box retailers including Best Buy Co. Inc. (NYSE: BBY), Staples Inc. (Nasdaq: SPLS) and Barnes & Noble Inc. have closed stores, Wal-Mart has added or remodeled more than 120 supercenters last fiscal year.